A cone beam image is taken using dental cone beam computed tomography technology. These images are three-dimensional pictures of your teeth, soft tissues, nerve pathways, bone. Cone beam images are only used when regular x-ray images don’t suffice because the radiation associated with cone beam images is slightly higher than regular dental x-rays. Because of this, you may have to wear a gown of some kind and you must notify your dentist if you believe you could be pregnant. Although cone beam CT images are similar to traditional CT imaging in terms of the type of image produced and its quality, these are different types of imaging. Cone beam imaging, in particular, uses a cone-shaped x-ray beam to move around the patient, capturing many images. This kind of imaging was based off the traditional CT imaging model, but requires a much smaller and less expensive machine, the kind of machine that could be placed in a dental outpatient office. Cone beam CT images also use less radiation than traditional CT images. With this, they are able to capture detailed images of the bone and can detect diseases of the jaw, dentition, bony structures of the face, the nasal cavity, and sinuses. However, since it is not a traditional CT image, cone beam CT images lack the ability to evaluate soft tissues such as muscles, lymph nodes, glands, and nerves. 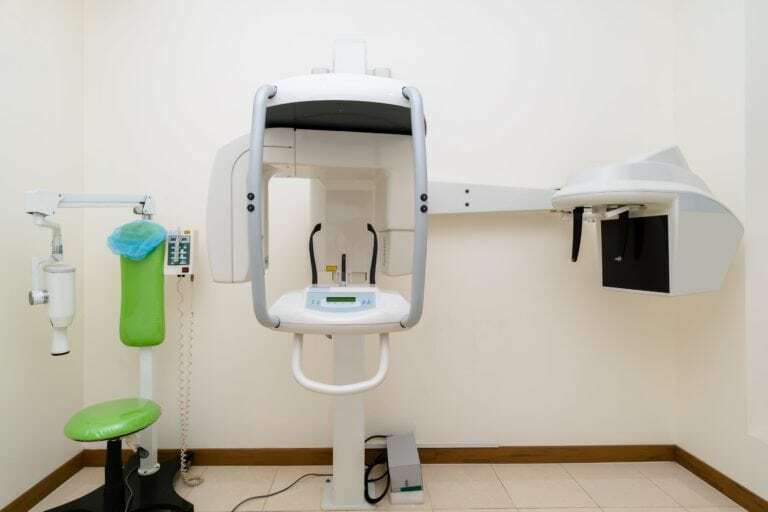 Cone beam CT images are used most commonly in planning treatment for orthodontic issues, however it can also be used for a variety of other issues. These include: surgical planning for impacted teeth, diagnosing TMJ disorder, accurate placement of dental implants, determining bone structure and tooth orientation, locating the origin of pain or pathology, cephalometric analysis, reconstructive surgery, detecting, measuring, and treating jaw tumors, and evaluation of the jaw, sinuses, nerve canals, and nasal cavity. When having a cone beam image taken, you will be asked to remove items that could interfere with the image. These types of items include: jewelry, eyeglasses, hairpins, and hearing aids. Removable dental appliances may also need to be removed as well. You will then be asked to either sit in an upright chair or lie down on a moveable table. Most cone beam CT scanners have a rotating C-arm that contains an x-ray source and detector, however other can have a table with a rotating gantry. Once you are in position, the C-arm or gantry will rotate entirely around the head, gathering and assembling multiple images into one 3-D image. CT scanners assemble information by generating 150-200 high resolution 2-D images per single rotation, and then these images are digitally combined to form one 3-D image. Cone Beam CT images have many benefits including better image quality, a single scan can produce multiple views and provide more information than conventional x-rays, they can image bone and soft tissue at the same time, radiation does not remain in the patient’s body after the scan, and they are painless, noninvasive, and accurate. The only downside is the extremely rare risk of cancer from exposure to radiation, which is clearly outweighed with all the benefits.